There are a number of popular buttercreams in the world. Swiss, Italian, French, and American are all fairly well known, but Russian buttercream is just starting to become known in the baking world. How does is differ from the others? Each kind of buttercream can be flavored in various ways, but basically Italian, Swiss, and French buttercreams are made with a variety of cooked sugar syrups. They also require the use of a thermometer to ensure their respective sugar syrups reach the proper temperature (with the exception of French Buttercream, which doesn’t always require a thermometer - although it’s highly recommended for those under 5, over 80, or immune-impaired). American Buttercream is by far my least favorite - truth be known, I don’t even think it should be called buttercream, but it’s popular with many because it’s so fast and easy to prepare, and does not require the use of a thermometer - you just dump confectioner’s sugar and butter in a bowl and mix them together. And finally, Russian Buttercream. Russian Buttercream is as easy to make as American (actually easier), but it has the same silky smooth texture and depth of flavor as Italian, Swiss, and French. Great, great stuff. I hope you’ll give it a try. Italian: made by combining a hot sugar syrup with beaten egg whites and softened butter (my personal favorite). It has a silky smooth texture, delicate flavor, and is very stable at room temperature for extended periods of time. You must use a thermometer when making Italian Meringue Buttercream. Swiss: made by heating sugar and egg whites together before whipping, cooling, and adding softened butter. It has a silky smooth texture, delicate flavor, and is fairly stable at room temperature, but not quite as stable as Italian Meringue Buttercream. You must use a thermometer when making Swiss Meringue Buttercream. French: made by combining a hot sugar syrup with beaten egg yolks and softened butter. It has a silky smooth texture and delicate flavor, but it’s is a little softer than Italian or Swiss Buttercream and is not very stable at room temperature. Not all recipes for French buttercream call for the use of a thermometer, but it’s recommended when feeding those under 5, over 80, or the immune-impaired. American: made with softened butter and confectioner’s sugar. It’s texture is extremely gritty and the flavor is extremely sweet. It’s gross and disgusting and I cannot recommend you make it… ever. Russian: made with just two ingredients… chilled sweetened condensed milk and butter. That’s it. There’s no need for a thermometer because sweetened condensed milk contains all the sugar you need and it’s already been cooked. The texture of Russian Buttercream is silky smooth. It’s pretty stable at room temperature too. So today my Russian Buttercream is actually going to be a Russian-Mexican fusion because I’ll be using dulce de leche in place of traditional sweetened condensed milk. For decades home cooks would make dulce de leche by simmering unopened cans of sweetened condensed milk for hours until the milk inside would caramelize. Most people did this successfully, but there were always stories of those who were not so successful. I don’t know about you, but the thought of a can of sticky, molten caramel exploding all over my kitchen kept me from ever trying. Thankfully, at some point, sweetened condensed milk manufacturers decided to assume the risk for us, and home cooks the world over rejoiced. Ok, that might be a stretch, but yay! Start with room temperature butter, about 70F. A hand mixer works well when making a small batch of this buttercream, but you’ll want to use a stand mixer for larger batches. Whip the butter for 2-3 minutes until it’s light and fluffy (the photo above is after about 1 minute). Here we are after 3 full minutes - see how light the color of the butter is? Time to add the chilled dulce de leche - be sure it’s well chilled to keep the butter from getting too warm. Whip them together until light and fluffy, scraping the bowl as needed. You’ll want to taste it carefully and add some fine table salt to taste - just enough to highlight the butter and caramel flavors. If you’re a fan of salted caramel, sprinkle the finished buttercream with flaked or coarse salt just before serving. Yum! Well, that’s all there is to it. Super, super simple, don’t you think? Next up, I’ll be sharing a fun way to use this buttercream. Until then, have a great day. In a medium mixing bowl, beat room temperature butter using a hand mixer for 2-3 minutes, until light in color and very fluffy. Add chilled dulce de leche and continue beating with a hand mixer for 1 minute. Taste the mixture carefully and add just enough salt to highlight the butter and caramel flavors; continue whipping for another minute or two, scraping the bowl if needed. Note: to make salted caramel variation, sprinkle flaked or coarse salt on top of buttercream when serving. I had the pleasure of making these Chocolate Cupcakes with blue Italian Meringue Buttercream for a baby shower this weekend. The cupcakes bake up with flat tops, making them the perfect platform for festive swirls of the silkiest, best tasting buttercream you can imagine. The cupcake recipe will make 36. You'll have to double the buttercream recipe to decorate them all, but you'll be left with a few cups of buttercream to freeze for another day. For chocolate cupcakes, I like to use brown grease-proof liners. I also love using this heavy weight commercial quality cupcake pan. To start the recipe, we need to combine Dutch-processed cocoa and boiling water. 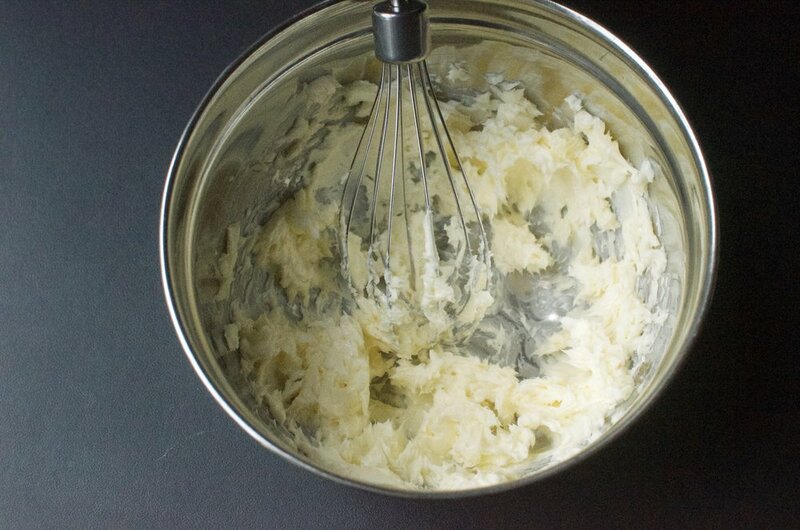 Whisk them together until smooth. Then set it aside to cool, keeping it covered to prevent it from drying out. In the bowl of a stand mixer fitted with a BeaterBlade attachment, cream room temperature butter and sugar together. Add the eggs, salt, and vanilla extract. Then add the reserved cocoa mixture, buttermilk, flour, baking soda, and baking powder. The batter will make 36 cupcakes - be sure to bake just one batch of 12 cupcakes at a time. Cover the bowl of batter with plastic wrap and allow it to sit on the counter until you're ready to bake the next batch (being sure to allow the pan to cool before filling). I use a #20 scoop (3 tablespoons) to fill my cupcake liners so every cupcake ends up being the same size. The Italian Meringue recipe and photos can be found here. Make 2 separate batches to frost 36 cupcakes (a double batch is too big to make in a 6-quart stand mixer, but single batches will fit in a 5 or 6-quart mixer fine). Note: you may want to use clear vanilla if you plan to tint your buttercream. I use pure vanilla extract 99.99% of the time, but I make a rare exception when I tint buttercream a light color that would otherwise be affected by the slightly ivory tone pure vanilla extract naturally lends to buttercream. For this blue shade, I tinted the buttercream with this gel coloring. I also used these round sprinkles, and the piping tip I used was the 2nd smallest star tip from this set of large Ateco polycarbonate piping tips. I love polycarbonate tips and prefer them to metal because they don't bend out of shape, you can see air bubbles through them, they don't rust or discolor, and they don't have a seam so they're super easy to clean. Love them. Line muffin pan with paper liners; set aside until needed. In a medium bowl, whisk together boiling water and cocoa powder until smooth; cover with plastic wrap and cool until needed. In another medium bowl, whisk together the flour, baking soda, and baking powder; set aside until needed. In the bowl of a stand mixer fitted with a BeaterBlade attachment, cream butter and sugar for a couple minutes until light and fluffy. Add eggs, vanilla, and salt; mix until combined. Add cooled cocoa mixture, flour mixture, and buttermilk; mix just until combined. Use a #20 scoop to fill cupcake liners and tap the pan on the counter to even the level of batter before baking. Bake cupcakes for 15-20 minutes until a toothpick inserted in the center comes out clean. Cool cupcakes in pan for several minutes before transferring to a cooling rack to cool completely. Note: be sure cupcakes are completely cool before frosting with Italian Meringue Buttercream (recipe and photos found here). You'll need to make 2 batches to frost 36 cupcakes. Has Spring sprung in your neighborhood? It certainly has here. We have beautiful blooms everywhere and the bright sunshine reminds me that I need to share these cheerfully scrumptious lemon cupcakes with you. Be careful though... they're addictive. Happy Spring!!! In a small bowl, combine the buttermilk, egg whites, vanilla extract, and lemon oil; set aside. In a medium bowl, whisk together the cake flour, baking powder, and salt; set aside. In the bowl of a stand mixer fitted with the flat beater, cream butter and sugar on medium speed for 3 minutes. Turn off the mixer and add 1/3 of the flour mixture; mix just until the dry ingredients are moistened. Add 1/2 of the wet ingredients; mix just until incorporated. Repeat process with 1/3 of the dry, remaining half of the wet, and remaining third of the dry ingredients, occasionally scraping down the sides of the bowl. Set mixture aside to rest for 20 minutes. Fill each liner with a level scoop of batter using a #20 scoop. Bake for 15 minutes, cool completely. Pipe with French Vanilla Buttercream (recipe below). In the bowl of a stand mixer fitted with the whisk attachment, beat the egg yolks until light yellow in color; turn off the mixer until you're ready to add the hot sugar syrup. In a heavy-bottomed saucepan, heat the sugar and corn syrup together, stirring constantly, until the mixture comes to a full rolling boil. Immediately pour a small amount of the hot syrup into the beaten egg yolks and turn the mixer on right away for a few seconds; turn off and scrape the inside of the bowl with a spatula. Repeat the process using 1/2 of the remaining sugar syrup; mix again for several seconds, turn off, and scrape bowl. Add the remaining sugar syrup and turn the mixer back on, this time allowing it to continue to mix until the egg mixture is completely cool, about 5 minutes (feel the bottom of the bowl to gauge the temperature of the mixture). When the egg mixture is completely cool, beat in the softened butter and vanilla extract, scraping down the sides of the bowl once or twice. Pipe buttercream onto completely cooled cupcakes. Garnish as desired and serve cupcakes at room temperature. Refrigerate unused buttercream - allow to come to room temp before using (you may need to whisk the room temp buttercream to restore it's creamy texture).